Here I am, 32 years old, father of two gorgeous girls, well invested in what most people would call a successful career in chemistry, founder and owner of an innovative, moderately profitable molecular recycling business — and thrilled to be looking for a probably somewhat underpaid and overworked job in tech. Yep! You read that correctly, I’m very thrilled to be looking for THAT job and, no, my friends and family don’t understand why either. This whole mess started a long time ago. I was only 12 years old and my father, a quite successful computer science engineer, was making a superhuman effort to try to answer my question: why did a single 3.5-inch floppy disk (known back then as a “micro-disk”) could hold as much information as 18 of the larger, decade older, 8-inch predecessors? (A reasonable question that every 12-year-old kid needs have answered to go on about life.) It did not make sense to me how something a quarter as small in size could be in fact be several times larger in data storage capacity. Needless to say, I’ve had a profound love for technology since I was very young. As my current Ironhack teacher and mentor Hector Bliss puts it, “If you have not accidentally deleted your operating system, you really have not lived”. Oh boy, have I lived! Especially when I couldn’t get the household PC to turn on after installing that upgrade everyone said was not needed; I still couldn’t resist trying it out the new graphics and finding out if it made it faster. I’m quite certain that my brother has not forgiven me yet for deleting that school project he had worked on for weeks and was due the following day or my mother’s accounting books that were lost forever. In all fairness, who could have possibly anticipated that a harmless operating system upgrade could go sour? Backups are for losers! Or so I used to believe. On my mother’s side, it had always been about the family’s chemical business; growing up we were expected to lend a hand to my grandfather, one of the founders. Against all odds, I decided to take the advice and go into chemistry instead of tech and coding in college. I was also very lucky to attend what is arguably the best chemistry program in Mexico. The resulting degree was a shiny diploma but, to my astonishment, no job for me at the family business due to internal grudges amongst partners at the time. There I was, unemployed, without a buck in my pocket and, most importantly, unhappy. After holding a couple of jobs elsewhere, my older brother who was a chemical salesman and I decided to start a company in material science based on recycled goods. It started as a way to make a bit more money to cover for rising school tuitions for both his children and my daughter. Noble as the idea of recycling waste is, I admit we both desperately needed the extra income. We identified an opportunity to use recycled plastics and other wastes to create first grade materials for new plastic products that could compete at a lower price compared to the regular rate. Profitable and awesome as it turned out to be, the process of stabilizing the product quality and with it the overall business took a long time, came at high cost, and met inhumane resistance from both competitors and collaborators alike. But we survived, and that resulted in a change in the way these specific materials are manufactured for good — a small but meaningful improvement to the world, which is more than many start-ups can say. The ride has been rewarding! Yet, for me, not entirely fulfilling since I still feel technology calling. Since I left college I have tried over and over, quite unsuccessfully, to go into tech. Specifically, software development, which I find both thrilling and limited only by imagination. Also, I believe that software is the most important and fastest driver to improve many of the world’s problems of our time. Yet the only entry point to this fascinating industry, at least in my mind, was going back to college to study computer science, which does not really guarantee an entrance to the code development industry in these lightning-fast, ever-changing tech industry days. Also, the time and financial investments are considerable, especially if you have a family to support at the same time. 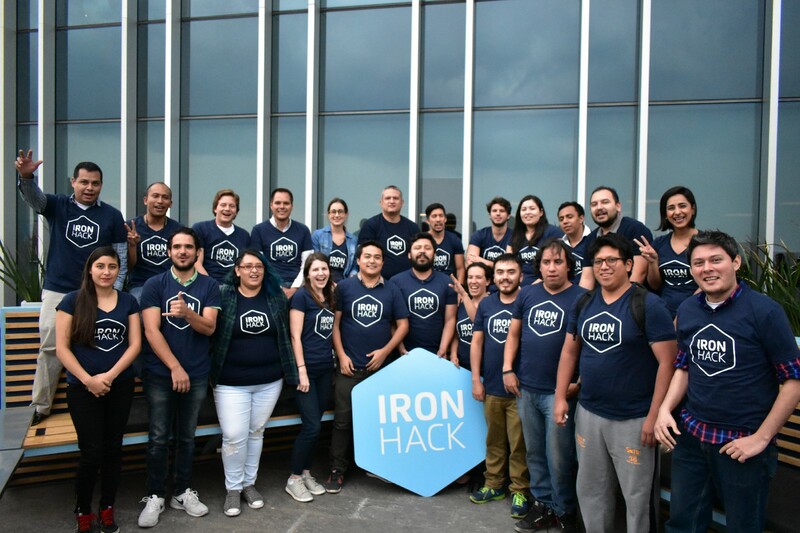 After a somewhat lucky search, I learned about this ultra-fast and efficient program called Ironhack, a coding boot camp designed as a way to close the gap between the tech industry’s need for qualified developers and the people looking at becoming developers. This program promised some ambitious results, including coding a video game at the end of week 2, going from no coding experience to full-stack web developer in a total of 9 weeks, and helping you land a job in the field afterwards. Ironhack, which was listed amongst the best scored programs in most listings, was practically in my backyard being in the city where I lived. It took me half a minute to get in touch with them and sign myself up for the next session. I’m about to finish my Ironhack program. It has been a rough ride learning an enormous amount of information in an extremely short amount of time along with really talented and competitive individuals. The result has turned out to be fantastic — a ride that resembles more a roller coaster then a college class. Ironically, this also turns out to be the best explanations of why the 3.5-in floppy disk stores many times more data than its larger size predecessor: “intensity.” Just like the Ironhack program, intensity, ambition and reinvention is what brings Ironhack to the next level in expert coder development. Recently, I was watching a meet-up talk by Hector Bliss where he pleaded with everyone to “not be a hater and not to listen to haters”. He defined “haters” as the people that did not share their coding knowledge. He insisted we should also be inviting to others in this wonderful and young web and software tech industry, one that benefits more from group collaboration then any individual talent. “There is room for everyone who really wants in.” I felt those words almost like a divine sign that keeps inviting me forward and asking me not to surrender, reassuring that the ride will be rough but there will be help along the way. I wish I could also say that my transition to this new challenge and industry has been fully realized and that I feel certain about where I am going next in this plan to reinvent myself, or at least that the unknown ahead isn’t scary. But what I can say is that I am an Ironhacker and that I am going forward with the next challenge. So bring it on!